If you are looking for a Habey mini PC which is a little more refined than the industrial aimed systems, you might be interested in a new addition to the Habey range in the form of the Habey BIS-6922 Fanless PC. The Habey BIS-6922 Fanless PC measures just 9.6 x 6.1 x 2.1 inches in size and is equipped with a passive cooling system making it very quite, even though it can be equipped with a choice of Sandy Bridge or Ivy Bridge processors. 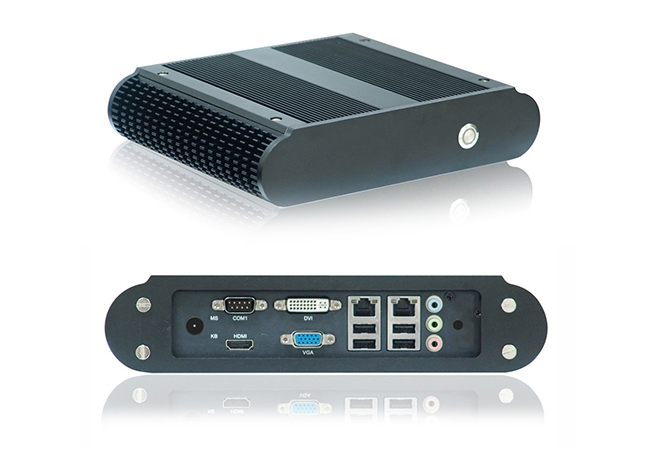 Other features of the Habey BIS-6922 Fanless PC includes support for up to 8 GB of RAM a 2.5 inch drive bay, and a couple of PCIe and mini PCIe expansion ports. Together with 4 x USB 2.0 connections, 1 x HDMI, 1 x DVI, 1 xVGA, and serial ports, mic, headphone, and line jacks, 2 x Ethernet jacks. “In this demonstration Habey USA runs Windows 8 on the BIS-6922 with Core i7-3740QM Quad core 3rd Gen Ivy Bridge Fanless System. The video shows the graphics performance using a demo provided by the Windows Presentation Foundation or (WPF). The parameters of the test are two independent displays at full 1080p HD resolution.